By Keith Cowing on March 31, 2015 6:17 PM. "They're called identical twins because their genomes are identical. But even though all of their DNA is the same, they clearly are not. The environment must play a role in how identical twins and everyone else uses their genes to become who they are." "A multitude of human research investigations currently are underway and are scheduled for upcoming expeditions aboard the space station by NASA and its international partners. 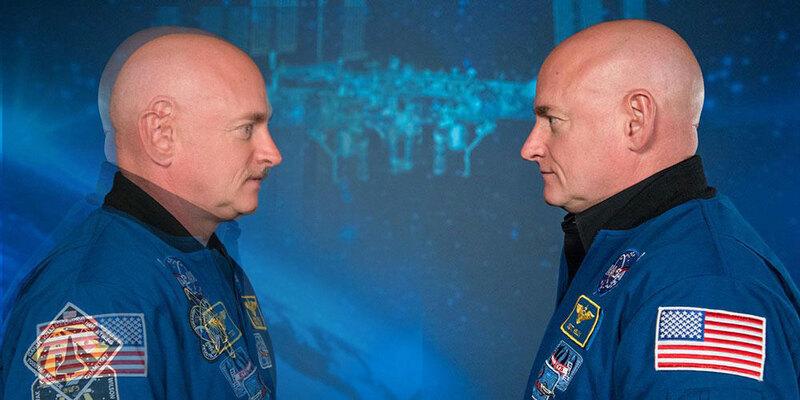 The opportunity to compare the effects of spaceflight accumulated over one year and observe changes in the genetic makeup between twin brothers is new. These investigations could have lasting implications for protecting astronauts on deep space exploration missions, including travel to asteroids and Mars." Keith's note: NASA has spent a lot of time hyping the whole twins thing. It is important to note that "identical" twins are not identical. Just take that face-to-face photo of the Kelly twins (larger view), flip one image, superimpose it on the other, align for facial features and look what you get: altered skull shape (ergo brain shape) and ear shape and placement. But they are identical - how did that happen? Hmm. Prenatal environment is likely the prime factor but other things during their early lives could be at work as well. To be certain the Kelly twins are vastly more alike at the genetic level than this crude photo comparison might suggest. But they are not identical - and they become less identical with every passing day. Continue reading Twins in Space: More Smoke and Mirrors on NASA's Road to Mars. By Keith Cowing on March 30, 2015 8:16 PM. Keith's note: It has been more than a month since the Pioneering Space National Summit was held in Washington, DC - an event whose attendees and discussions have remained more or less secret. Other than a paragraph with a bunch of random buzz words nothing has been heard from this group of space illuminati. Its as if their secret meeting never even happened. Now there is yet another closed door, off-the-record event being held in Washington in an undisclosed location for 2 days this week titled "Humans Orbiting Mars" sponsored by the Planetary Society (an organization that was not included in the list of sponsors for the earlier event for some strange reason). Once again many NASA civil servants will be in attendance and speaking in an official capacity as government officials - but we'll never know what they say since the rest of us are not special enough to be invited - or allowed to listen in. Yet this event - just like its already-evaporating predecessor - has assigned itself with the task of setting space policy priorities for a space program paid for by 300 million people. Continue reading Making Space Policy In Secret (Again). By Keith Cowing on March 30, 2015 4:59 PM. Keith's note: Why is NASA saying that this is going to be a year-long mission? It is not. Close - but not a year. NASA goes out of their way to use simple math on Twitter to make their #YearInSpace point - but - that math also easily shows that Kelly is only going to be in space for 342 days. A year is 365 days long. I guess its too much to ask for NASA to be accurate on Twitter as it simultaneously hypes all of this STEM education stuff. Its not as if any of the 9 million Twitter followers are actually paying attention. Or are they? Reader (Max Fagin) comment: "And actually, since the ISS will be going through two high-beta periods in the next 342 days (one in late Dec 2015, and one in early June 2016) there won't even be that many sunsets. In the 342 day period starting with the last Soyuz launch, the ISS will only see 10,372 sun-rise/set pairs." Click on image to enlarge. Reader (Max Fagin) correction: "High-Beta periods are June and December of THIS YEAR (not 2016). And if you define a sunset/rise cycle as a complete eclipse (rather than just anytime the sun contacts the horizon), the number falls to 10356." Keith's update: Unlike a certain space agency, Max is quick to clarify and update inaccurate data. Continue reading More Confusing Twitter Math From @NASA (Update). By Keith Cowing on March 30, 2015 1:21 PM. "Luke Skywalker's home in "Star Wars" is the desert planet Tatooine, with twin sunsets because it orbits two stars. So far, only uninhabitable gas-giant planets have been identified circling such binary stars, and many researchers believe rocky planets cannot form there. Now, mathematical simulations show that Earth-like, solid planets such as Tatooine likely exist and may be widespread." By Keith Cowing on March 29, 2015 9:04 PM. By Keith Cowing on March 27, 2015 12:17 PM. "The U.S. Air Force must modify its annual "launch capability" contract with United Launch Alliance, to level the playing field for new competitors of the joint venture of Lockheed Martin Corp and Boeing Co, senior U.S. Air Force and Pentagon officials told lawmakers on Wednesday. ... [Air Force Space Command Commander General John Hyten] said the contract made it impossible to have a fair competition, backing an argument often made by privately held Space Exploration Technologies. The company, also called SpaceX, hopes to be certified by June to compete for some satellite launches now carried out solely by ULA." By Keith Cowing on March 26, 2015 10:20 AM. "Although DSN is meeting its current operational commitments, budget reductions have challenged the Network's ability to maintain these performance levels and threaten its future reliability. ... If budget reductions continue, DSN faces an increased risk that it will be unable to meet future operational commitments or complete the upgrade project on schedule. We also found that NASA, JPL, and DSN have significantly deviated from Federal and Agency policies, standards, and governance methodologies for the security of the Network's IT and physical infrastructure." By Keith Cowing on March 26, 2015 8:56 AM. Keith's note: Rory Kronmiller arrived at Everest Base Camp, Nepal this morning along with his specially designed UAS quadricopter. Rory is in Nepal with his brother, Michael who is in Kathmandu. Mike and Rory are in Nepal to test out the use of drones for Search And Rescue and bridge inspection tasks. This is being done as part of a STEM education project between the Bullis School in Maryland and Kanjirowa National School in Kathmandu, Nepal. You may find their last names familiar: Mike and Rory are the sons of Kate (Orbital ATK) and Ted Kronmiller (aerospace lawyer). By Keith Cowing on March 25, 2015 5:56 PM. "Lightfoot was poised to reveal the Option A versus B choice in December, but when it came time for the press conference, said only that more time was needed. NASA has not publicly stated what came up at the last minute. Rumors are that Option B was the choice then, too. The December press conference was announced with 6 hours notice; today's notice was only 2 hours and the briefing was exactly at the same time as Dava Newman's nomination to be NASA Deputy Administrator was being considered by the Senate Commerce, Science, and Transportation Committee (it was approved by the committee)." "Dwayne Brown from NASA SMD PAO only gave trivial advance notice for media to register for a telecon regarding Dawn entering orbit around the dwarf planet Ceres. Dwayne sent a media advisory out at 12:56 pm ET for a 2:00 pm ET telecon - and only gave media 45 minutes to contact him for dial-in information. Smart move to send this out while half of the U.S. was eating lunch. Only 2 media actually dialed in to ask questions." Keith's note: NASA has become increasingly gun shy about announcing its big decisions. It is also increasingly inept when it comes to assembling media briefings on these decisions - as well as major mission events. Recently they continually kicked the can down the road on commercial crew and totally bungled a Dawn event. And yet NASA gets all bent out of shape when the media does not pay attention to their news or the spin that they try to put on it. Duh, I wonder why. By Keith Cowing on March 25, 2015 3:26 PM. "7. Nomination of Dr. Dava J. Newman, of Massachusetts, to be Deputy Administrator of the National Aeronautics and Space Administration"
Keith's update: The Senate Commerce, Science, and Transportation Committee has reported favorably on the nomination of Dava Newman to be NASA Deputy Administrator. By Keith Cowing on March 25, 2015 3:13 PM. "NASA Wednesday announced more details in its plan for its Asteroid Redirect Mission (ARM), which in the mid-2020s will test a number of new capabilities needed for future human expeditions to deep space, including to Mars. NASA also announced it has increased the detection of near-Earth Asteroids by 65 percent since launching its asteroid initiative three years ago. For ARM, a robotic spacecraft will capture a boulder from the surface of a near-Earth asteroid and move it into a stable orbit around the moon for exploration by astronauts, all in support of advancing the nation's journey to Mars." Keith's note: The original idea would have had astronauts actually go into deep space and visit an asteroid as part of a plan for longer duration spaceflight from Earth. There are some real operational applications to a mission like that. Then the policy wonks got involved and NASA started to lower expectations because they could not figure out how to do the engineering behind the press release images. NASA has now wimped out completely and decided to only grab a small boulder from an asteroid that a robot has already brought to lunar orbit as part of a pale Apollo reboot. Why even use humans at all for this? If NASA wants the boulder that bad why not just bring it back to Earth orbit where it would be much easier to access and study? NASA wants everyone to think that this is actually part of the things they need to do to send humans to Mars. And they make sure you know that when they issue press releases with titles such as "NASA Announces Next Steps on Journey to Mars: Progress on Asteroid Initiative." Yet there is no budget identified for any of this. Congress is formally against it. The planetary science community is either against it or has been blackmailed into tepid support. And the White House wonks who pushed this idea on NASA will be gone very soon - and with them goes their support. NASA doesn't ever address any of that, do they? If NASA wants to send humans on a "journey" to Mars then it needs to aim at Mars - not at the lowest hanging fruit on their capability matrix - fruit that they keep lowering. By Keith Cowing on March 24, 2015 10:57 PM. Reader note: "This isn't the first time NASA has spent $500000 with Gamla. Here is the ISS model they did for NASA Goddard as shown on Gamla's website. http://www.lifeinscale.net/ISS_model-Goddard_Center.asp"
Keith's note: What does NASA do with these models? They seem to order them every year. I have asked before but never have recieved an answer. Then again given what they spent to re-do Mike Suffredini's conference room, who cares, right? By Keith Cowing on March 24, 2015 7:31 PM. "The project has done an excellent job of managing its budget reserves, and this ability to efficiently address problems as they come up has enabled Webb to remain on schedule for its 2018 launch." "The proximity of all the elements and major subsystem schedules to the critical path means that a delay on any of the elements or major subsystems may reduce the overall project schedule reserve further, which could put the overall project schedule at risk. As a result, the project has less flexibility to choose which issues to mitigate. While the project has been able to reorganize work when necessary to mitigate schedule slips thus far, with further progression into subsequent integration and testing periods, flexibility will be diminished because work during integration and testing tends to be more serial, as the initiation of work is often dependent on the successful and timely completion of the prior work. This is particularly the case with JWST given its complexity." By Keith Cowing on March 24, 2015 3:25 PM. "In 2015, five of NASA's largest, most complex projects, several of which are at critical points in their development, are expected to consume 78 percent of the funds for NASA's major projects. Therefore, existing and new projects will be competing for remaining funds. Fully accounting for the funding, schedule, and technical challenges facing these projects is important due to the cascading effects these challenges could have across the portfolio. NASA has implemented several initiatives to reduce acquisition risk, but management of some of these initiatives remains a concern. For example, while NASA has implemented tools in recent years to provide better insight into and oversight of its acquisition projects, the training for and implementation of these tools have not been consistently and thoroughly applied." By Keith Cowing on March 24, 2015 12:06 PM. "SUMMARY: DoD, GSA, and NASA are considering amending the Federal Acquisition Regulation (FAR) to update the list of domestically nonavailable articles under the Buy American Act. DoD, GSA, and NASA are seeking information that will assist in identifying domestic capabilities and for evaluating whether some articles on the list of domestically nonavailable articles are now mined, produced, or manufactured in the United States in sufficient and reasonably available commercial quantities and of a satisfactory quality. ... The current domestically nonavailable listing at FAR 25.104 is as follow: ... Beef, corned, canned ... Cashew nuts ... Fair linen, altar ... Goat hair canvas ... Hemp yarn ... Rabbit fur felt ..."
By Marc Boucher on March 24, 2015 11:56 AM. "Entering into this new agreement with HAS will lead to enabling all variants of the Dream Chaser spacecraft to land in Houston, offering the ability to return cargo and science to Houston directly from space," said Mark Sirangelo, corporate vice president of SNC's Space Systems. "Through this agreement, we want to promote broad awareness of the importance of utilizing low-Earth orbit as a source of research, science and the expansion of space flight that are critical to Houston's ongoing position as a 'Space City.' Houston has earned its place at the forefront of space exploration with such institutes as NASA's Johnson Space Center, Rice Space University, the Texas Medical Center, the Bay Area Houston Economic Partnership and many other organizations." By Keith Cowing on March 23, 2015 12:51 PM. By Keith Cowing on March 23, 2015 9:32 AM. CNN reports that one of @SenTedCruz presidential campaign themes is "NASA's main focus on space exploration"
By Keith Cowing on March 20, 2015 11:28 PM. "A woman who was among 13 selected for training as possible astronauts in the early 1960s has died at her northern Michigan home. She was 89. Bernice Steadman was a member of the so-called "Mercury 13." NASA dropped the program, and it was 22 more years before a U.S. woman went to space." By Keith Cowing on March 20, 2015 6:49 PM. "February 5, 1918 ~ March 19, 2015 (age 97)"
"How many colleagues do you know who retired at 92 with 70+ years at Government service? 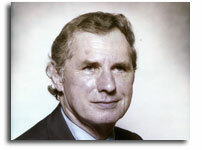 Seaton Norman, Telecommunications Manager for Code 761 retired from Goddard on September 3, 2010. He has served 30 years in the U.S. Air Force, and 40-plus years in communications at NASA. 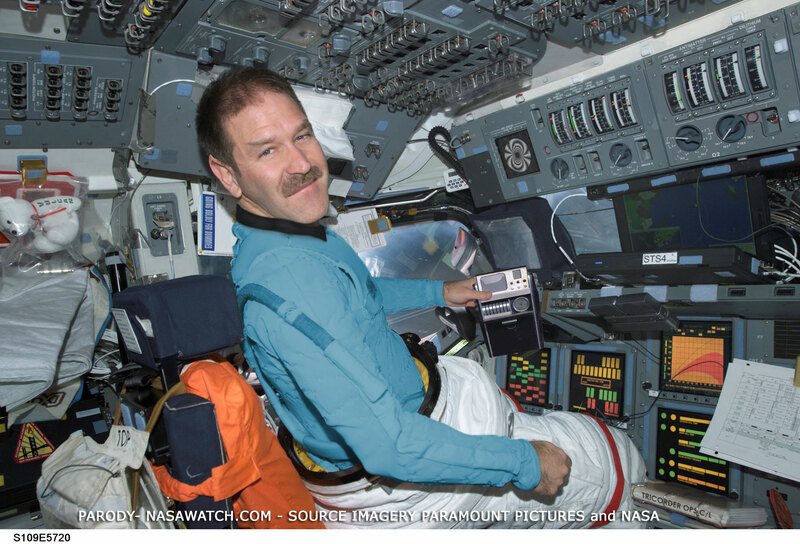 During his career at NASA, he has received the Goddard Award of Merit, the NASA Exceptional Service award, the Silver Snoopy Award, and received the NASA Space Flight Awareness Award for his many years of support for the Shuttle program." By Keith Cowing on March 19, 2015 11:43 PM. "In 2013, more than two years after the Obama administration had issued a directive ordering reform of federal scientific integrity policies - including those governing media access - we published the first version of Grading Government Transparency. This new report added social media policies to the mix, and expanded the number of agencies to 17. Our analysis showed that while many agencies had substantially improved their policies since 2008, significant issues remained." "This data provides a window into how people are interacting with the government online. The data comes from a unified Google Analytics account for U.S. federal government agencies known as the Digital Analytics Program. This program helps government agencies understand how people find, access, and use government services online. The program does not track individuals, and anonymizes the IP addresses of visitors." By Keith Cowing on March 18, 2015 12:28 PM. "In order to decrease the risk that the GSDO Program will experience cost increases or schedule delays, we recommended the Associate Administrator for Human Exploration and Operations reevaluate allowing GSDO to complete Critical Design Review before the SLS and Orion Programs. In response to a draft of our report, NASA management concurred with our recommendation ... However, NASA management noted a risk that the dates planned for SLS and Orion could slip and the GSDO review occur first. Accordingly, NASA should closely monitor the Programs to ensure any such risk is mitigated so as to avoid significant cost increases or schedule delays." By Keith Cowing on March 18, 2015 6:04 AM. "The two made a number of pointed comments about each other before Ms Shotwell responded sarcastically when asked why SpaceX thought it could provide launches to the US government for an average $100m. SpaceX claims ULA's launches cost US taxpayers an average of $400m each. Ms Shotwell was asked why the company claimed to be able to offer its services for 25 per cent of the ULA price. "It's hard for me to say," Ms Shotwell replied. "I don't know how to build a $400m rocket. The more difficult question would be to say that I don't understand how ULA are as expensive as they are." "If [ULA] stops the Delta IV rocket launches," said Rogers, "is there anybody else that can compete with you for those missions?" Shotwell struggled to answer, referring vaguely to there being international launch providers. She then went back and conceded that the Pentagon probably wouldn't trust those international services with sensitive military payloads. That was precisely the point, said Rogers. "You would have a monopoly, is where I'm going on this," he said." By Keith Cowing on March 17, 2015 4:18 PM. "Service Corporation International (NYSE: SCI), the largest provider of deathcare products and services in North America, today announced that it will nominate Dr. Ellen Ochoa to be elected to the SCI Board of Directors at the Company's Annual Meeting of Shareholders to be held in May 2015." By Keith Cowing on March 17, 2015 2:17 PM. "The Planetary Society's "Humans Orbiting Mars" workshop is an invitation-only gathering of top science, engineering, and policy professionals. The goal of the workshop is to build consensus on the key elements of a long-term, cost constrained, executable Program to send humans to Mars. This program would consist of a series of steps leading to a Mars orbital mission and potential rendezvous with the Martian moon, Phobos, in the early 2030s as a crucial step towards future missions that will land on the surface of the Red Planet. While the workshop itself will be closed to the media, a press briefing will follow and a full report will be released later in the year." Keith's note: Here we go again. First we had the Pioneering Space National Summit - a closed door, mystery participant, no-media event concerning human spaceflight which will produce output at a later TBD date - an event that excluded the Planetary Society. Not to be out done, the Planetary Society is going to have their own closed door, mystery participant, no-media event concerning human spaceflight which will produce output at a later TBD date. The three participants at the press event after the actual workshop are not going to say anything that they have not said a hundred times before and will most certainly give it their own spin anyway. And of course this effort will not coordinate with anything that came from the other momentous space policy event - even though the topics both addressed (apparently) have great potential overlap and synergy. Yet once again the space advocates will claim that they have accomplished something by talking about things. Here's a crazy idea: Why not wait to have this discussion until May when the Humans to Mars Summit discuses the same things that these two stealth events discussed except that they do so IN PUBLIC and ONLINE? While only a few people will actually get inside the spacecraft that go to Mars, everyone else gets to pay for these trips one way or another. After three decades of waving their arms around behind closed doors it is time for these space advocacy groups to get off their asses, step out into the sunshine, and publicly discuss the plans that they have to spend everyone else's tax dollars - and do so by actually involving these taxpayers. Otherwise these space advocate leaders/experts need to sit down and shut up and stop complaining that no one is listening or that no one understands. Given the slow motion implosion of the Mars One reality TV show/infomercial/pyramid scheme that very same taxpaying public is going to wonder whether any of these humans to Mars concepts are viable. I am not certain that any of the current crop of space activists is qualified to answer that question since they were either shamelessly cheering this stunt on or hiding from the media to avoid publicly casting any doubt. That said, someone in the space world needs to get serious - about being serious - and they need to do so soon. Otherwise no one is going to go to Mars any time soon. Continue reading Good News Everyone: Another Closed Door Humans to Mars Thing. By Keith Cowing on March 17, 2015 12:42 PM. Potential Impacts: Area of impact primarily poleward of 50 degrees Geomagnetic Latitude. Induced Currents - Power system voltage irregularities possible, false alarms may be triggered on some protection devices. Spacecraft - Systems may experience surface charging; increased drag on low Earth-orbit satellites and orientation problems may occur. Navigation - Intermittent satellite navigation (GPS) problems, including loss-of-lock and increased range error may occur. Radio - HF (high frequency) radio may be intermittent. 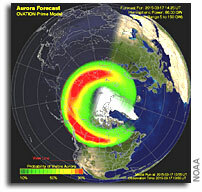 Aurora - Aurora may be seen as low as Pennsylvania to Iowa to Oregon." By Keith Cowing on March 15, 2015 6:15 PM. "During a subcommittee hearing on NASA's budget, Cruz asked Bolden to explain the agency's core mission. Our core mission from the very beginning has been to investigate, explore space and the Earth environment, and to help us make this place a better place," Bolden replied. Cruz, true to form, balked at the "Earth environment" part." "Bolden defended spending more money on Earth science activities, saying he is "proud" of it since it's led to a greater understanding of the planet. "We can't go anywhere if the Kennedy Space Center goes underwater and we don't know it "We can't go anywhere if the Kennedy Space Center goes underwater and we don't know it -- and that's understanding our environment," Bolden said, in a clear reference to global warming-related sea level rise. "It is absolutely critical that we understand Earth's environment because this is the only place that we have to live." Keith's note: Perhaps if Sen. Cruz were to take the time to read the public law that originated in Congress - the one that established NASA and provides its charter - he'd understand why NASA does what it does. Chapter 201: National Aeronautics and Space Program: Congressional Declaration of Policy and Purpose: "(d) Objectives of Aeronautical and Space Activities.--The aeronautical and space activities of the United States shall be conducted so as to contribute materially to one or more of the following objectives: (1) The expansion of human knowledge of the Earth and of phenomena in the atmosphere and space. ..."
"(c) The aeronautical and space activities of the United States shall be conducted so as to contribute materially to one or more of the following objectives: (1) The expansion of human knowledge of phenomena in the atmosphere and space;"
As for adding "Earth" to the NASA authorization act, contrary to what all the Obama haters have been trying to post, it was not added in 2010 but rather was added by the "National Aeronautics and Space Administration Authorization Act, 1985," Public Law 98-361, July 16, 1984, section 110(b) (98 Stat. 426). when Ronald Reagan was president with a Republican-controlled Senate. "(d) The aeronautical and space activities of the United States shall be conducted so as to contribute materially to one or more of the following objectives: (1) The expansion of human knowledge of the Earth and of phenomena in the atmosphere and space;"
By Keith Cowing on March 15, 2015 12:56 PM. "But changing the conversation isn't really enough, and that poll shows why a majority of Americans do not support returning to the moon or going to Mars, and just a little over 50 percent of them support increasing funding for human spaceflight. This tells us what our next project is we need to expand the conversation about space, not just change it. All of us who are part of the space community see space's potential. But space is a niche issue for a very simple reason space isn't relevant to the average person." Keith's note: This op ed makes some astute and frank observations. But then it quickly goes on to utterly ignore these very same observations. In a nutshell this op ed about space activism openly admits that space activism has had little or no effect on space policy over the past three decades. Their solution? Have the same space activist organizations - and the exact same people (activists) - use the same tactics that they openly admit have been ineffective. Moreover they want to sell Congress and the taxpaying public a space policy that they know that people neither want - or understand. By Keith Cowing on March 14, 2015 9:54 AM. Keith's note: Lockheed Martin just started a big media rollout for their new cargo concept for NASA's CRS-2 contract. Included in the PR effort are some infographics. Everyone makes mistakes, but given the large amount of money they are pouring into all of this, you'd think that they'd use a spell checker. By Keith Cowing on March 13, 2015 11:30 AM. "Following a successful launch at 10:44 p.m. EDT Thursday, NASA's four Magnetospheric Multiscale (MMS) spacecraft are positioned in Earth's orbit to begin the first space mission dedicated to the study of a phenomenon called magnetic reconnection. This process is thought to be the catalyst for some of the most powerful explosions in our solar system." By Keith Cowing on March 12, 2015 11:51 AM. "Expedition 42 Commander Barry Wilmore of NASA, and Alexander Samokutyaev and Elena Serova of the Russian Federal Space Agency landed their Soyuz TMA-14M spacecraft in Kazakhstan at approximately 10:07 p.m. EDT. Russian recovery teams are helping the crew exit the Soyuz vehicle and adjust to gravity after their stay in space." NASA Forgot the Largest Rocket Booster It Built - in the 1960s. By Keith Cowing on March 11, 2015 5:37 PM. "The largest, most powerful rocket booster ever built successfully fired up Wednesday ..."
"Between Sept. 25, 1965 and June 17, 1967, three static test firings were done. 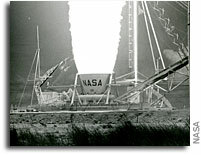 SL-1 was fired at night, and the flame was clearly visible from Miami 50 km away, producing over 3 million pounds of thrust. SL-2 was fired with similar success and relatively uneventful. 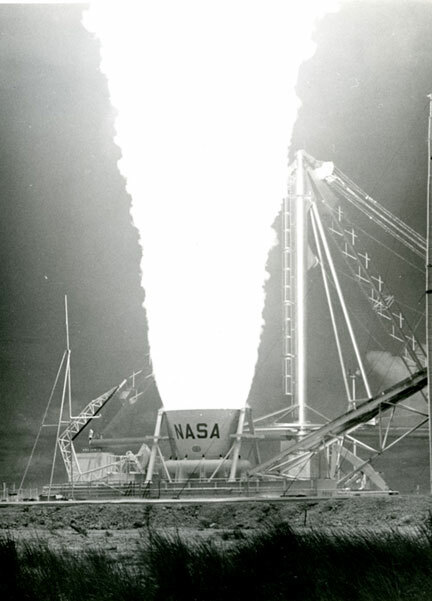 SL-3, the third and what would be the final test rocket, used a partially submerged nozzle and produced 2,670,000 kgf thrust, making it the largest solid-fuel rocket ever." Keith's note: That picture shows 5.88 million pounds of good old 1960s Aerojet rocket thrust folks (larger image) compared with only 3.6 million pounds of 2015 Orbital ATK thrust. Funny how NASA has forgotten the amazing things it once paid Aerojet to do back in the day. Indeed it has been thumping this incorrect "most powerful rocket booster" mantra for weeks. By Keith Cowing on March 11, 2015 4:01 PM. Keith's note: Dava Newman was chosen as the nominee for NASA Deputy Administrator 5 months ago in October 2014. We have heard nothing since then. Dava Newman has yet to testify before the Senate (and get their approval) so it is unclear when she will be formally confirmed. With impending food fights in the Republican-led Congress, such routine things as nominations may be stalled - or (worse) may become opportunities to score partisan points against the Administration - with the nominee taking the brunt of the negative energy. "a lot of traveling in my final two years". Stay Tuned. Keith's update: Word has it that Dava Newman will be present with Charlie Bolden at the Senate Commerce Committee hearing on Thursday. By Marc Boucher on March 11, 2015 3:15 PM. "The largest, most powerful rocket booster ever built successfully fired up Wednesday for a major-milestone ground test in preparation for future missions to help propel NASA's Space Launch System (SLS) rocket and Orion spacecraft to deep space destinations, including an asteroid and Mars." By Keith Cowing on March 10, 2015 7:33 PM. Keith's note: If the QM-1 SRB engine is going to burn for 126 seconds (per NASA) that means that 693 million pounds of propellant will be used - or 693 million tons - depending on which Tweet you believe. 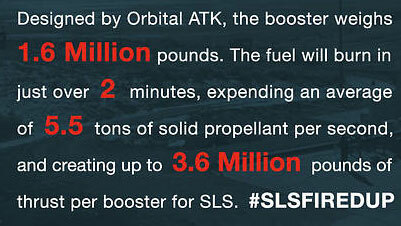 But wait: the whole SRB only weighs 1.6 million pounds. Hmm ... NASA's infographic says that it is only burning 5.5 tons per second. No "million" pounds or tons is mentioned. Clearly @NASASocial needs to spend a little more time reading before tweeting. By Keith Cowing on March 10, 2015 7:53 AM. "Lugging groceries and supplies to the astronauts on the International Space Station may not be as cool as ferrying the astronauts themselves into orbit. But the NASA contract to fly cargo to the station in unmanned rocket ships has attracted bids from high-profile companies in what analysts say is another indication of commercial spaceflight's recent renaissance. It appears that at least five space firms have submitted proposals for the work, including giants such as Boeing and Lockheed Martin, which didn't bother to bid on the work the last time. In a new sort of space race, the contract has touched off an intense competition between stalwart defense contractors and new space start-ups that have, in just a few years, shown they can compete." By Keith Cowing on March 6, 2015 2:33 PM. Keith's note: Dwayne Brown from NASA SMD PAO only gave trivial advance notice for media to register for a telecon regarding Dawn entering orbit around the dwarf planet Ceres. Dwayne sent a media advisory out at 12:56 pm ET for a 2:00 pm ET telecon - and only gave media 45 minutes to contact him for dial-in information. Smart move to send this out while half of the U.S. was eating lunch. Only 2 media actually dialed in to ask questions. Well done, Dwayne. Like you NASA people did not know within a millisecond - months in advance - when the spacecraft was going to arrive at Ceres such that you could have sent something out just a little bit earlier? And then you all wonder why the media doesn't pay more attention to these things? By Keith Cowing on March 5, 2015 12:22 PM. "Administrator Bolden made it clear in his answers that the Obama Administration has no contingency plan in place to send U.S. astronauts to the International Space Station if Russia chooses to end the current agreement that allows our astronauts to travel to the space station on board its Soyuz capsules." 'If Russia stops flying U.S. astronauts to the International Space Station, the U.S., lacking a backup plan, would have no choice but to abandon the multibillion dollar outpost to its own fate, NASA Administrator Charles Bolden said Wednesday. "We would make an orderly evacuation," Bolden said during a U.S. House Appropriations subcommittee hearing." Keith's note: Culberson is not exaggerating. When asked, Bolden could not give a 'yes' or 'no' answer to rather specific and repeated questions as to whether or not NASA has a post-Russia ISS contingency plan in place. Bolden stumbled for a bit before he started to talk about an orderly evacuation of the ISS. Culberson interrupted at one point and said "please tell me that you do". Bolden also seemed to suggest that the U.S. can operate the ISS without Russian permission/cooperation. By Keith Cowing on March 5, 2015 8:58 AM. "More likely, Kelly's and Kornienko's tests will just confirm in greater detail what we already know from several previous long-duration missions: Our current space habitats are not adequate for voyages to other worlds. The lack of money to build these habitats, more than any lack of medical knowledge, is what keeps humans from Mars and other off-world destinations. ... It would be unfair to blame NASA alone for this shortsightedness. Integrating artificial gravity and better propulsion into its human spaceflight program would require many billions of dollars, and that money is not forthcoming from Congress. So NASA has struck a pragmatic course, tinkering with well-worn technologies instead of spending the financial and political capital to develop new ones." Keith's note: Will NASA learn anything from the one year space twins study? Yes, of course they will. Will this knowledge help us "go to Mars"? (gotta use that phrase once a day, right NASA?). Who knows. Not likely. The studies are superficial and scattered in their focus. As this article notes NASA will, at best, simply understand their collective lack of capability to semi-safely send humans to Mars slightly better. Meanwhile, NASA will still kick the can down the road to Mars (I used the Mars meme twice, NASA!). NASA does not have the money or the scientific strategy to actually answer the questions it needs to answer. So they grab everything they can slap a Mars label on it and proclaim progress on the road to Mars (three times!). As was the case with John Glenn's mission to solve aging problems in space we will never see the results of this research - in any form - that NASA uses to justify the hype surrounding this otherwise ho hum stay aboard ISS. And we will still be in Earth - not Mars - orbit. And the news media will still be confused which twin has the moustache. The ISS still has an amazing untapped potential to actually address these very real issues of human physiology and long duration spaceflight with direct applicability to Mars. But NASA is simply not up to the task of using these resources in a concerted, strategic, long-term fashion - and assembling the resources to do so. They just make it up as they go. And their poorly equipped junior partner CASIS is simply clueless. By Keith Cowing on March 5, 2015 7:42 AM. "Space Exploration Technologies Corp. ("SpaceX") filed a Petition ("Pet.") for inter partes review of U.S. Patent No. 8,678,321 B2 ("the '321 patent"). The Petition challenges the patentability of claims 14 and 15 of the '321 patent on the ground of obviousness under 35 U.S.C. 103.1 Blue Origin LLC, the owner of the '321 patent, did not file a Preliminary Response to the Petition." "IV. CONCLUSION Because the challenged claims are not amenable to construction, we are unable to reach a determination on the reasonable likelihood of SpaceX prevailing on the prior art ground asserted in the Petition. V. ORDER For the foregoing reasons, it is ORDERED that the Petition is denied." Keith's note: The title of this post is taken directly from words and statements used in the USPTO decision. Read the document. As best as I can figure this legal mumbo jumbo out, everyone involved is confused about what the patent claims and whether it can be challenged - and if so, how. Yet the SpaceX Internet fan boys are all over social media chastising non-believers and saying that this is a big win for SpaceX while others are saying that its a win for Blue Origin. Indeed, sources inside SpaceX now say that this decision is good for them. If SpaceX thinks that this decision is good for them - and they want people to know that this is good for them - then they need to put out a statement that says so. Expecting the Internet to figure it out - clearly and accurately - and then tell the world - is not going to work. Keith's update: But wait. There's more. There is another USPTO document (see excerpt below) that just fell out of cyberspace into my inbox wherein USPTO agrees with claims made by SpaceX. Taken together these two documents are not a formal decision for - or against - Blue Origin/SpaceX. The patent is still the patent and more lawyers will need to weigh in before anyone changes anything in that patent - if anything is ever changed. My point still stands with regard to letting Internet chatter suffice for statements by the actual parties to this dispute (SpaceX and Blue Origin) and I await their responses/non-responses. Continue reading SpaceX Barge Landing Patent Petition Challenge Denied - and Accepted. By Keith Cowing on March 4, 2015 8:11 PM. "Mr. Chairman and Members of the Subcommittee, I am pleased to have this opportunity to discuss NASA's FY 2016 budget request. The President is proposing an FY 2016 budget of $18.5 billion for NASA, building on the significant investments the Administration has made in America's space program over the past six years, enabled through the strong and consistent support by this Committee and the Congress." By Keith Cowing on March 4, 2015 2:02 PM. Bolden - at the risk of offending the committee - we do not do reductions in force voluntarily. Congress sees civil servants as the problem. Bolden - you do not get something for nothing. If you want us to cut size of govt that means cutting people. By Keith Cowing on March 4, 2015 12:31 PM. Correction. Rep Fattah said "I like the way you think, Mr. Chairman" - when NASA TV freezes you often have to guess who is talking. Bolden: "It does not matter how much money you give me I am going to say that I need more"
Keith's note: I was watching this hearing on NASA TV. About halfway through the video froze while the audio continued. As such it was often hard to tell who was speaking. After correcting my earlier tweet, I posted some additional comments on Twitter that ended up with a member of Congress responding. See below for that conversation. Continue reading Bolden Budget Quotes From Today's Budget Hearing (Update). By Keith Cowing on March 4, 2015 10:06 AM. Reader note: "FYI I tried to reach CASIS by phone. When you call their CASIS Corporate Headquarters listed here i.e. 321.253.5101 and hit 3 for "Contracts" you get a dead end. Your call is eventually disconnected. By Keith Cowing on March 3, 2015 9:28 AM. "Today marks a special anniversary for the NASA family. It was 100 years ago, on March 3, 1915, when Congress created the National Advisory Committee for Aeronautics (NACA), the organization from which NASA was created in 1958. The NACA was formed because our nation's leaders were concerned the U.S. was losing its edge in aviation technology to Europe, where World War 1 was raging on. Its mission, in part, was to "supervise and direct the scientific study of the problems of flight with a view to their practical solution." As you all know, we not only regained that edge, but we became the world leaders in civil aviation." By Keith Cowing on March 3, 2015 9:17 AM. 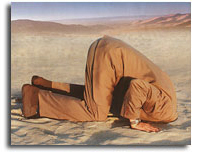 "Still, [ULA Chief Executive Tory Bruno] also said that ULA is far more reliable in launching on schedule than SpaceX. When asked if he thought it was risky to rely on SpaceX he said, "I do." "We have a perfect mission success record and our schedule certainty is also substantial," he said. "Launching on time is huge." SpaceX took exception to Bruno's comments. "The Air Force and the taxpayers deserve more from ULA and its latest CEO, whose remarks are purposely misleading, but not unexpected," SpaceX spokesman John Taylor said in a statement. "In anticipation of having to face real competition for the first time, ULA is distorting the facts in an effort to hide its own shortcomings. This is merely the latest example that ULA is realizing that its long-held monopoly is coming to an end." 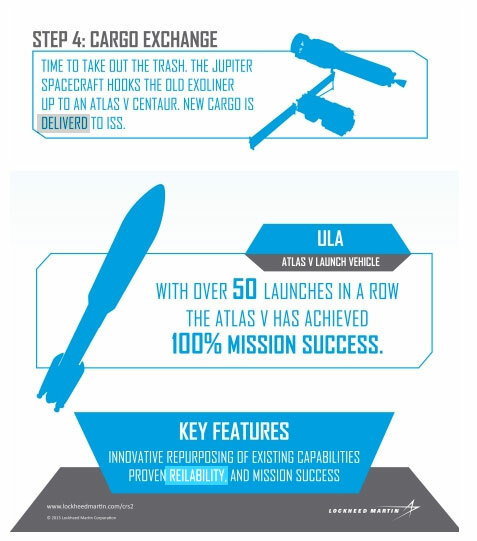 Keith's note: Then there's this gem: "Bruno said that since ULA's inception, the company "has cut the price of launch in half, and I'm going to cut it in half again." While he declined to provide specific numbers, he vowed to "be competitive with SpaceX's prices." Hmmm ... with reusable stages SpaceX may do this too - making their cost even harder to beat. At some point Bruno will not be able to turn a profit if he's focused only on cutting prices to chase SpaceX down this path. By Keith Cowing on March 2, 2015 7:19 PM. Keith's update: Wow. Mike and I got retweeted from orbit. How cool. Keith's note: In space Samantha Cristoforetti honors Leonard Nimoy/Spock by continuing the Vulcan science officer tradition on ISS. Altered imagery by Michael Okuda. Years ago, when John Grunsfeld left NASA headquarters, Mike Okuda made a "vulcanized" version of John. Everyone loved it - including (so it would seem) the Smithsonian's National Air & Space Museum. For a number for years, there was a copy of this faux picture adjacent to Hubble instruments on display that John had helped to bring back to Earth. It took quite some time for the Smithsonian to notice the details in the photos. Oops. By Keith Cowing on March 2, 2015 3:32 PM. "Senator Mikulski has been a tireless champion for NASA, and has helped pave the way for future exploration and our journey to Mars." "Today at Henderson's Wharf Inn in Fells Point, U.S. Senator Barbara A. Mikulski (D-Md.) announced she has decided not to run for re-election. Senator Mikulski, who will complete her 5th term in office in January, 2017, says she wants to focus for the next two years on working for her constituents and for the nation." By Keith Cowing on March 2, 2015 12:35 PM. By Marc Boucher on March 2, 2015 8:08 AM. "A SpaceX's Falcon 9 rocket launched the ABS 3A and EUTELSAT 115 West B satellites towards a supersynchronous transfer orbit. The launch took place on time when the launch window opened at 10:50 p.m. EST on Sunday, March 1, 2015, from Space Launch Complex 40 at Cape Canaveral Air Force Station, Florida." Marc's note: With this launch SpaceX has completed three launches so far this year. They completed six last year. By mid-year they should have equalled last years total and probably surpassed it based on the current schedule. Their launch cadence is clearly picking up as you would expect with a rocket and company that is maturing. By Marc Boucher on March 2, 2015 8:00 AM. "Outside the International Space Station, Expedition 42 Commander Barry Wilmore and Flight Engineer Terry Virts of NASA conducted their third spacewalk in eight days March 1 to install antennas and communications gear that will be used to provide rendezvous and navigational information to visiting vehicles approaching the complex in the future, including the new U.S. commercial crew vehicles." This page is an archive of entries from March 2015 listed from newest to oldest. February 2015 is the previous archive. April 2015 is the next archive.